As one of SAS' newest systems engineers, recently joining the Americas Artificial Intelligence Team, I’m incredibly excited to gain expertise in artificial intelligence and machine learning. I also look forward to applying my knowledge to enable others to leverage the advanced technologies that SAS offers. However, as a recent graduate with no prior experience coding in SAS, I expected a steep learning curve and a slow introduction into the world of AI. When I first arrived on campus right after ringing in 2019, I had no idea how fast I would employ SAS technology to create a tangible AI application. During my second week on the job, I learned about the development and deployment of effective computer vision models. Not only did I create a demo to distinguish between a valid company logo and a counterfeit version, but I was also amazed by the ease and speed at which it could be done. Read on for a look at the model and how it works. For this model, I wanted to showcase the potential of using computer vision to protect corporate identity — in this case, a company’s logo. I used the familiar SAS logo as an example of a valid company logo, and for demonstration purposes, I employed the logo used by the Scandinavian Airlines System to represent what a counterfeit could look like. Although this airline is a legitimate business that isn’t knocking off SAS (they are actually one of our customers), the two logos showcase the technology’s ability to distinguish between similar branding. Thus, the model could easily be adapted to detect actual counterfeits. This data was then used to train the model to identify the two logos through machine learning. 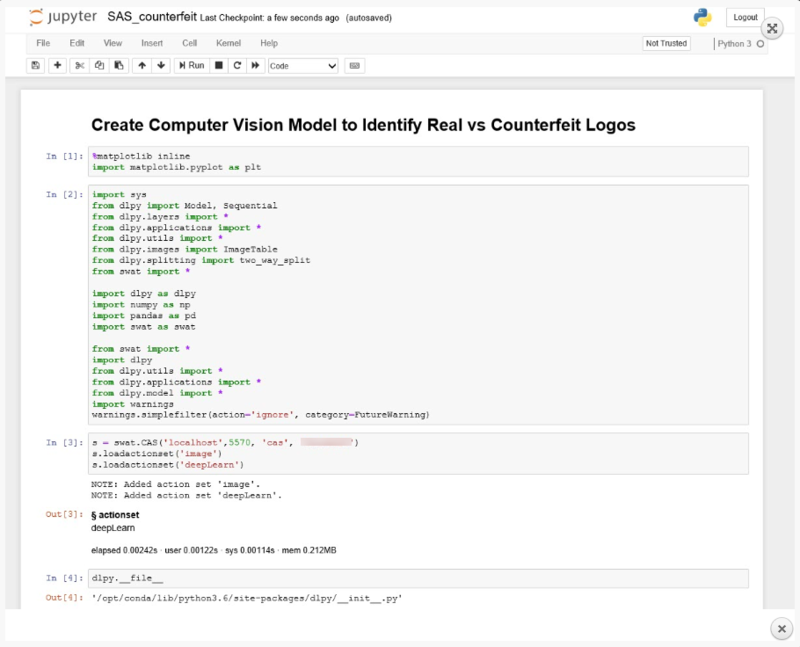 The model was written on the SAS Deep Learning Python Interface, DLPy, using a YOLO (You Only Look Once) algorithm. To test the model’s effectiveness in object detection, additional validation images were supplied to verify its ability to identify both valid and counterfeit versions of the logo. In the following image of SAS headquarters in Cary, the model correctly identified the displayed logo as the valid version with a confidence level of 0.61. One of the key advantages of using the DLPy interface is the ability to easily deploy the model to various SAS engines. I simply created an ASTORE file as the model output, which can be deployed with SAS Event Stream Processing (ESP), Cloud Analytics Service (CAS), or Micro Analytic Service (MAS). However, the model can also be deployed when SAS technology is not available by creating an ONNX file as the output. This type of file can be used to integrate the model into an iOS application, for example. As I conclude my first weeks at SAS, I am thrilled by the opportunity to continue to build expertise in SAS technologies and programming. For the next several months, I will be attending the Customer Advisory Academy in Cary, and I look forward to applying the knowledge and skills I gain to the creation of other AI applications in the future! Want to learn more about object detection in computer vision? Read this blog post! Augusta Zhang is a systems engineer on the Americas Artificial Intelligence Team. She joined the SAS Customer Advisory Academy in January 2019 and enjoys the opportunity to provide sales support and enablement to both external and internal customers. Prior to joining SAS, she received bachelor’s degrees in economics and statistical science from Cornell University. Augusta enjoys being active in her free time, and she is an avid country music fan.